Portland (OR) police seized more than a pound of MDMA from a man who crashed his car into a police vehicle. Image Courtesy of PPD. An Oregon Man — identified as 25-year-old Toren Paul Flom — was in possession of 458 grams of the psychoactive drug, Molly/MDMA (3,4-Methylenedioxymethamphetamine) in his vehicle when he crashed his car into an occupied Drugs and Vice Division canine unit vehicle, according to a Portland Police Bureau press release. "The suspect was arrested without further incident," police said in a statement. "There were no injuries to the suspect, officers or police canine as a result of the crash." 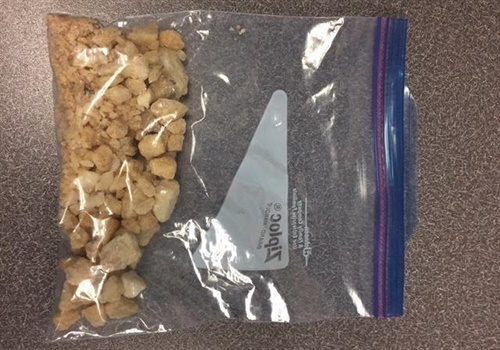 However, discovery of the drugs led to a subsequent search of the suspect's residence, where investigators located and seized an additional 115 grams of MDMA. The estimated wholesale value of the seized MDMA is $45,000.